Overwhelmed with the Bollywood gala Sonam’s wedding, the eco-friendly fabric fashion and celebrating ramadan in style, we are now geared up for Cannes Film Festival 2018. We are truly in awe of all those beautiful Indian divas who took fashion to another level at the Cannes 2018. 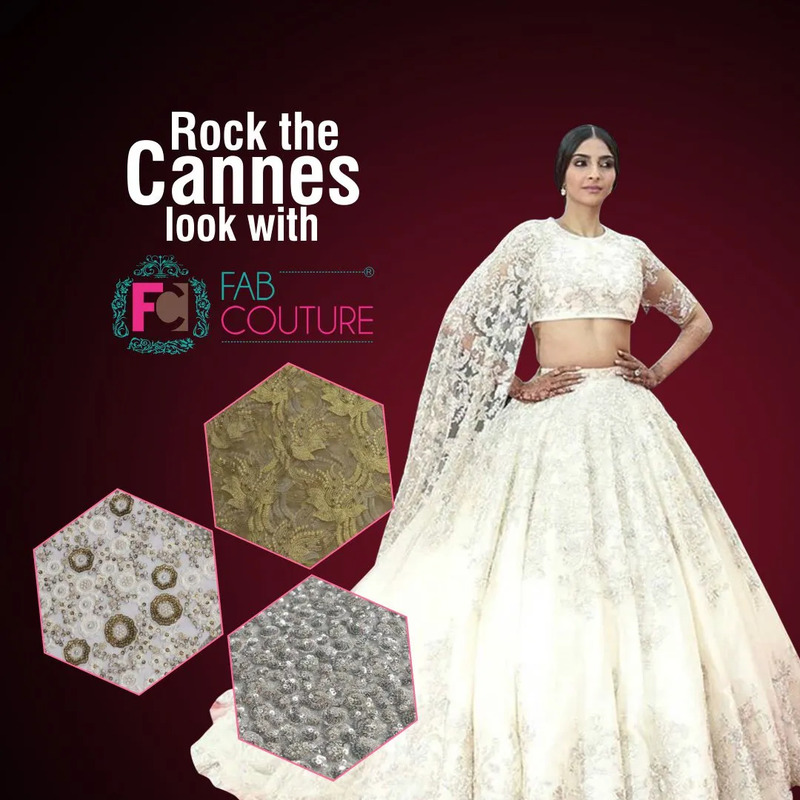 Here’s our take on our favourite Indian divas, their look on the red carpet and how you can rock the Cannes look with Fab Couture! Let’s start with the one actress who started off way long back at the Cannes festival. It’s Aishwarya Rai’s 17th time and we absolutely love what she has to offer, every time. She looked fabulous in the multi coloured, Michael Cinco creation. It had a 3-meter long train brimming with pink, aqua, and purple embroidery and sequins pattern. Her fans couldn’t get enough of her. She definitely rocked it in style. Deepika Padukone sported a dramatic pink gown! Do we like it? Nah, we love it! She looked hot and lovely as ever on the red carpet. The hairdo, make up and accessories were so on point, the critics had nothing much to say! She stepped out of her usual conventional style, and we love her boldness (especially, sticking out her tongue for the cameras)! Sonam Kapoor is one of the actresses who we have all adored for her sense of style, charming smile and sweet attitude. The newlywed diva wore a heavily embroidered lehenga with a cape-like dupatta. The look was just perfect since the mehendi on her hands still remained from her D-day. She wore something unique and different, as always! Kangana Ranaut appeared for the first time at the Cannes Film Festival and managed to make a mark with her attitude and style. The plunging neckline looked super-hot on her; the bold and glittery jumpsuit is something most of them applauded. She is full of confidence, and looks great than ever before. 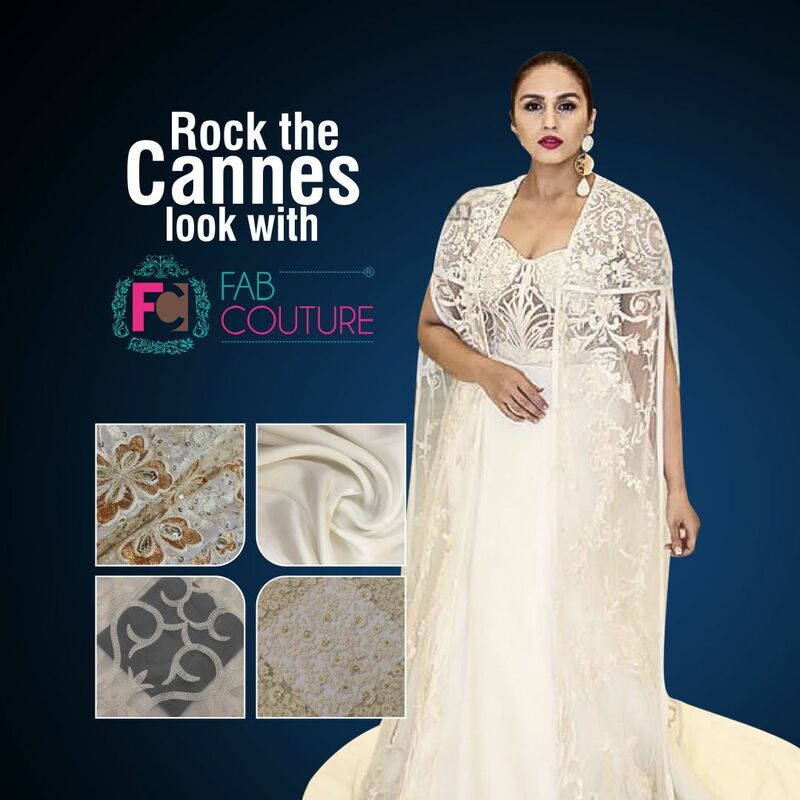 We saw actress Huma Qureshi in an angelic white and silver cape gown which was designed by Varun Bahl.She looked lovely and elegant while posing for the cameras, the makeup and hairdo was on point, and we love this particular look the most. Now, let’s talk about how we could carry-off an outfit which would look like a million bucks, but is actually budget friendly and drop dead gorgeous! Pick your favourite look, and make sure that you will be comfortable in that style, and design. It has to suit your body type, so be very careful with your choice! You can work around the design a little bit considering the occasion, and your comfort. Now, this is the main part. Speak to the designer about the material and colour options, and then you are good to go! FabCouture.in has so many fabric options on the website for you to choose from! You can pick different materials, and mix two fabrics as well. With the right fabrics and the style that you love, creating the Cannes look is just like a cake walk! Select the right fabrics from Fab Couture and you’ll have an amazing outfit that will turn heads, for sure!